This article was first published in January 2007 to mark the 60th Anniversary of the liberation of Auschwitz. It is of particular relevance in relation to the announced merger between Monsanto and Bayer and the worldwide campaign against Monsanto. Both companies are complicit in crimes against humanity, Monsanto’s agent orange used by the US military in Vietnam, IG-Farben Bayer’s historical links to Nazi war crimes. Today marks the 60th anniversary of the Soviet liberation of the Nazi death camp, Auschwitz. Elderly Holocaust survivors, former soldiers and world leaders have gathered in Poland to mark the 60th anniversary: “I would like to say to all the people on the Earth: This should never be repeated, ever,” said Maj. Anatoly Shapiro, 92, who led the first Soviet troops to enter Auschwitz. 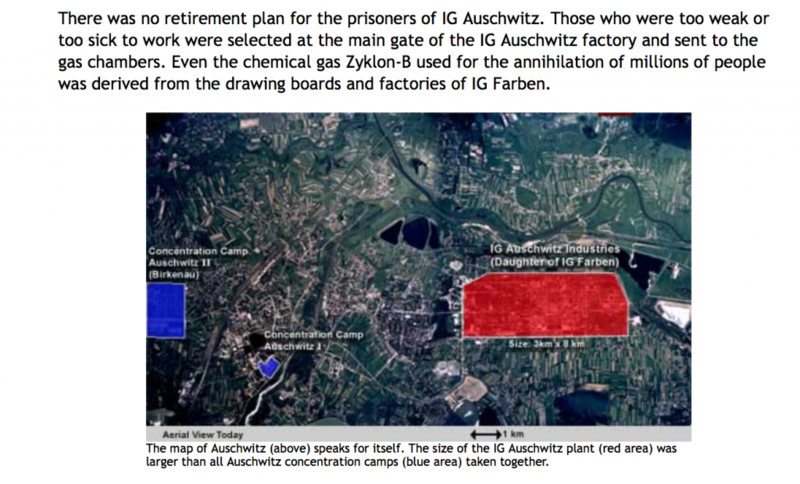 Lest we forget an important corporate participant in the Holocaust – two excerpts shed light on the role of IG Farben, ie. Bayer. IG Farben was the most powerful German corporate cartel in the first half of the 20th century and the single largest profiteer from the Second World War. IG (Interessengemeinschaft) stands for “Association of Common Interests”: IG Farben included BASF, Bayer, Hoechst, and other German chemical and pharmaceutical companies. As documents show, IG Farben was intimately involved with the human experimental atrocities committed by Mengele at Auschwitz. A German watchdog organization, the GBG Network, maintains copious documents and tracks Bayer Pharmaceutical activities. Below is an excerpt from a BBC documentary about an Auschwitz survivor who for years tried to get compensation from the pharmaceutical giant that carried out medical experiments on her. Now living in Dundee, Scotland, she tells her story in a BBC documentary. Another excerpt is from the website of the Dr. Rath Health Foundation. Dr. Matthias Rath heads a research development institute in nutritional and Cellular Medicine conducting basic research and clinical studies to scientifically document the health benefits of micronutrients in fighting a multitude of diseases. Dr. Rath was born in Stuttgart, Germany in 1955. Unethical human experiments are a major threat to vulnerable populations everywhere – including in the US where, for example, the EPA is seeking to conduct pesticide exposure experiments on children. The IG Farben culture continues to drive the chemical-pharmaceutical industry. “Profit urber alles” – that means ANYTHING goes – profit above all else. IG Farben was the only German company in the Third Reich that ran its own concentration camp. At least 30.000 slave workers died in this camp; a lot more were deported to the gas chambers. It was no coincidence that IG Farben built their giant new plant in Auschwitz, since the workforce they used (altogether about 300.000 people) was practically for free. The Zyklon B gas, which killed millions of Jews, Gypsies and other people was produced by IG Farben´s subsidiary company Degesch. In Germany a growing number of people do not understand that IG Farben´s successors Bayer, BASF and Hoechst still refuse to apologize for their misdeeds. It is hard to accept that after the war the companies were allowed to keep IG Farben´s entire property, whereas the surviving slave workers received nothing. Until today Bayer, BASF and Hoechst did not pay any wages to their former workers. In 1995 the coalition “Never again!” was created by the German Auschwitz Committee, Critical Shareholders and several organizations of former slave workers. In a joint appeal the coalition demands that there has to be an appropriate compensation by the companies for slave-workers and their descendants. Also the maintenance of the memorial at Auschwitz, which reminds the public of IG Farben´s victims, should be paid by the corporations. “Never again!” states that without verification of the past we always have to be present so that these crimes might never happen again. More than 1,500 individuals and about 100 German groups have signed this platform. The activities were organized by the Coalition against Bayer-dangers, a group that has monitored Bayer for 25 years. For years an Auschwitz survivor has tried to win compensation from the pharmaceutical giant that carried out medical experiments on her. Now living in Dundee, she tells her story in a BBC documentary. Zoe Polanska Palmer never imagined she would survive Dr Mengele’s experiments in Auschwitz. Nor did her German doctors. Like thousands of other children, she was destined to be gassed once her usefulness to Nazi science had ceased. During her two years at the camp, 13-year-old Zoe was forced to take tablets and pills as part of a series of pharmacological experiments, believed to be part of early birth control tests. But Zoe refused to die. Saved by a Russian doctor who evacuated her to Dachau, she recovered and eventually settled in Scotland. Now in her early 70s, she has been fighting for compensation and an apology from the German drug manufacturer, Bayer. Eyewitness testimonies held in the Auschwitz camp archive claim the doctor who force-fed her pills worked for the pharmaceutical company Bayer when it was part of the IG Farben conglomerate. His name was Dr Victor Capesius. It’s a name that Zoe can never forget. He helped Dr Mengele to conduct genetic experiments, usually on children, and also selected thousands of prisoners at the huge death camp, choosing those who might be useful and sending the rest to an immediate death with a flick of his finger. Dr Capesius was tried in Frankfurt for war crimes in 1963 and served time in prison. Another longtime Bayer employee, Helmut Vetter, also worked as a SS doctor at Auschwitz. He was involved in the testing of experimental vaccines and medicines on inmates and after the war he was executed for administering fatal injections. “The concentration camps were used as a huge laboratory for human experimentation,” says Wolfgang Eckhart, the Professor of Historical Medicine at Heidelberg University. Bayer says the company which exists today has nothing to do with its wartime counterpart. A spokesperson told the BBC: “Between 1925 and 1952, no company named Bayer existed, neither as a subsidiary of IG Farben nor as any other legal entity. Although it is nearly 60 years since the end of World War II, for survivors like Zoe the consequences of the war are as alive today as they were in January 1945 when the Russian Army liberated Auschwitz. After the war, Zoe married and settled in Scotland. There she underwent several painful operations to repair the damage done to her body. But she has never been able to have children. Now suffering from cancer, she is a remarkably cheerful woman whose home in a quiet suburb is punctuated with laughter from her jokes and tears from her memories. When I first travelled to meet her in July 2002, she was angry that she had been ignored for so long by the authorities managing the compensation fund set up by German industry and the German government. She had campaigned for 28 years but received nothing. “They want us all to die so they won’t have to pay out so much money,” Zoe says. Within weeks of the authorities being contacted by the BBC, Zoe received a cheque for a little over £2,000 from the German compensation fund. Documents show that in 1942 IG Farben´s branch office in Uerdingen, Germany got hold of the town’s Jewish cemetery. The forced sale price was way below the actual market value: 100,000 square meter property for 3,000 Reichsmark. After the war the property was passed on to IG Farben´s successor BAYER AG. The Nazis dissolved the Jewish Community of Uerdingen in 1942. Today all traces of the Jewish cemetery in Uerdingen have been completely obliterated. The city archive indicates that the cemetery was located approximately where the main gate to the BAYER factory currently stands. The COALITION AGAINST BAYER-DANGERS demands that the company publicly apologize for the defilement of the Uerdingen cemetery and affix a memorial plaque to the main gate of the company´s Uerdingen works. BAYER today is living off the fruits of Nazi legalism. On paper everything was legally correct: Julius Israel Kohn from the “Association of Jews in the German Reich” and Bernhard Hoffmann, the representative of IG Farben, signed the sales agreement in a notary´s office, and the copy of this seemingly standard real estate transaction has a stamp from the Krefeld tax office. At the same time the former culprits are publicly honored in Uerdingen. Fritz ter Meer served on the IG Farben board of directors from 1926 to 1945 and was the head officer directing the operations of the IG Farben factory at Auschwitz. The Nuremberg War Crimes Tribunal sentenced him to seven years in prison. He was released after serving only four years. Not long after, in 1956, Ter Meer was elevated to the chairman of the supervisory board at BAYER, a position he held for seven years. His grave in Krefeld has a meter-high wreath on it – donated by BAYER in recognition of his services. Scientific experiments were also done in other concentration camps. A decisive fact is that IG employee SS major Dr. med. Helmuth Vetter, stationed in several concentration camps, participated in these experiments by order of Bayer Leverkusen. At the same time as Dr. Joseph Mengele, he experimented in Auschwitz with medications that were designated “B-1012″, B-1034”, “3382” or “Rutenol”. The test preparations were not just applied to those prisoners who were ill, but also to healthy ones. These people were first infected on purpose through pills, powdered substances, injections or enemas. Many of the medications caused the victims to vomit or have bloody diarrhea. In most cases the prisoners died as a result of the experiments. The first and also the second series of therapeutic tests, held in Buchenwald between March 31st and April 11th 1943, had negative results due to insufficient contamination of the tested prisoners. Neither did the experiments in Auschwitz have evident successes. The scientific value of all these experiments, whether ordered by the IG Farben or not, was in fact zero. The test persons were in bad physical condition, caused by forced labor, insufficient and wrong nutrition and diseases in the concentration camp. Add to this the generally bad sanitary circumstances in the laboratories. “The test results in the concentration camps, as the IG laboratory specialists should know, could not be compared to results made under normal circumstances”.